This stretch of bike trail along Alum Creek in Westerville gets lots of traffic - runners, walkers, bikers - just not at the moment that I made this photo. The trail has of late seen an uptick in a new element of user - birders. 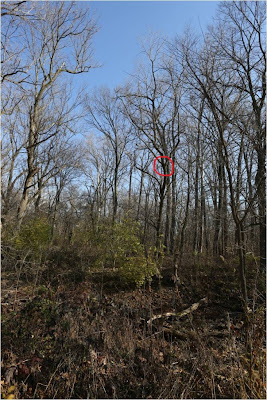 For some time, there has been an especially cooperative Eastern Screech-Owl, Megascops asio, roosting in a tree in the swatch of scruffy riparian woodland shown in this image. As this locale is only 12 minutes from my office, I've been wanting to pay a visit, camera in tow, for some time. Finally, after seeing another post to the Ohio Birds Listserv about the owl from Ira Shulgin, I had to trot up there yesterday over the lunch hour. Ira was good enough to give me precise directions to the roosting tree, which enabled me to quickly locate the little hooter. Young riparian, or streamside, woods are often scruffy places, in part due to a proliferation of Box-elder trees, Acer negundo. These gnarled and scraggly maples are often a dominant tree in early successional habitats, and what they lack in aesthetics they more than make up for in wildlife value. This is the owl's home turf, as seen from the edge of the bike path. 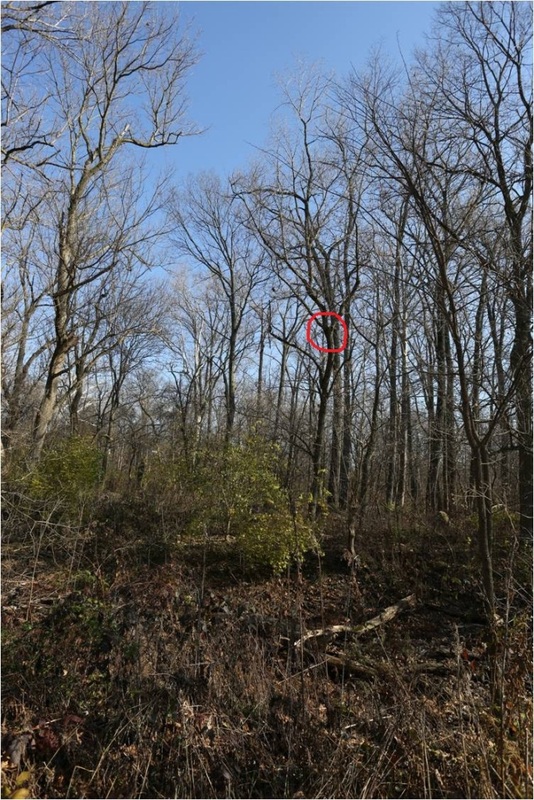 The spot that is circled in red marks the owl cavity about 20 feet up in a Box-elder, and it would be extremely easy to walk right by and never notice. Scores of people do just that every day. However, a close look at the Y-fork in the tree reveals a sleepy little owl, soaking up early afternoon rays. Eastern Screech-Owls are consummate bark mimics, and their plumage can match the bark of trees to a remarkable degree. Such camouflage serves to hide them well from potential predators, and the owls tend to hole up tight in spots such as this during the daylight hours. That doesn't mean that they'll be missed by everyone. Tree-gleaners such as chickadees, nuthatches, and titmice often stumble into roosting screech-owls as they go about their business of inspecting tree trunks. When this happens, quite the hue and cry will be made and before long an entire gang of noisy chickadees and other songbirds will form a conspicuous twittering crowd around the hapless owl. Many a birder has discovered a roosting owl with the assistance of mobbing tree-gleaners. Eastern Screech-Owls come in two classic color morphs: red, and gray. This individual is a gray, and this color form really blends well with bark. For the 20 minutes or so that I admired the bird, it never bothered to open its eyes and give me a glance, near as I could tell. Such slothfulness is typical daylight behavior for a screech-owl. These owls are very common throughout Ohio - easily our most common owl species. They have a strong affinity for streamside habitats, and places such as the site depicted in this post almost always have them. This is in part due to the Box-elder trees, which often form good roosting cavities. It's a great irony that tree species that are typically derided as worthless by loggers, foresters and the lumber industry are often of the greatest value to wildlife. If you are interested in owls - and who isn't! - mark your calendar for the weekend of February 15-17, 2013. That's when the Ohio Ornithological Society and Greater Mohican Audubon Society will be holding its Owls of North America Symposium at beautiful Mohican State Park. The event is headlined by the incomparable Denver Holt of the Owl Research Institute, and what a speaker he is! In addition to talks, there'll be field trips, owl-banding for Northern Saw-whet Owls, and much more. GO HERE to register. Did you see the rufous phase one too? Hi Vasanthi, no, not at this site but I believe there is one in the area. So beautiful! I was at a friend's house one day when an Eastern Screech flew in her window to roost on a grape vine wreath she had in the room! All the people freaked out but the bird was pretty calm..LOL! My hubby used the wreath to get the bird back out of the house. Just south of this location, on the steel bridge where the trail crosses the creek. The rufous morph roosts on top girders of this steel bridge. Thanks for the tip, Vasanthi, I'll have to go check out that owl, too. I LOVE the little screech owls. Heard them all the time as a child in NY. Have only heard a few in MI.